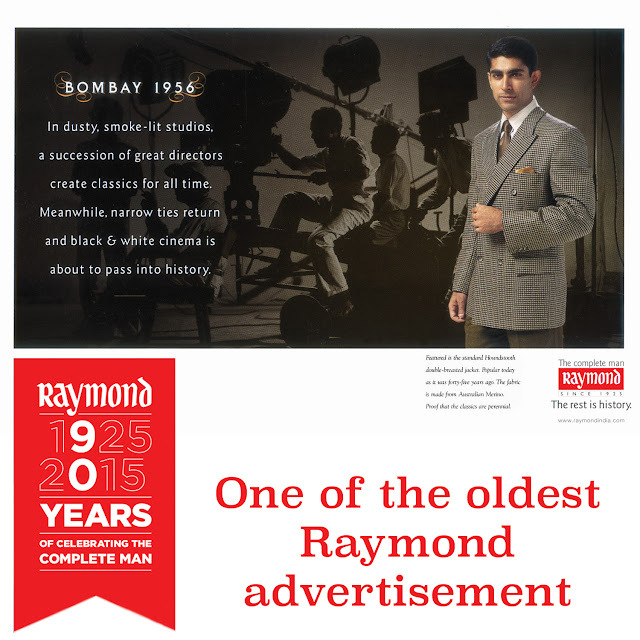 How does one even begin to trace the story of a legacy brand like Raymond which is even older than one’s grandmother or great grand mother ? … We at Delhi Style Blog has always been fascinated with legacy brands and their stories of evolution … Everyone is going somewhere … for some the paths have been more important than the journey … and for some, the destination have been more important than either the path or the journey …. And for a select few uber survivors, the point of origin has always been equally important as the ongoing path, journey or destination … These are the people and brands that have forged their own paths through nascent territories, picking up and assimilating all that is good, great and formative along each trail …. In the 90 years of Raymond’s existence … India and its people have grown from strength to strength on all frontiers … As we traced the story of Raymond, and researched on it, it became intertwined with the story of India emerging … If any student of history or more precisely, Indian fashion history were to select one constant to create a timeline of change and prosperity of a growing India … Raymond’s evolution could well be that constant !! 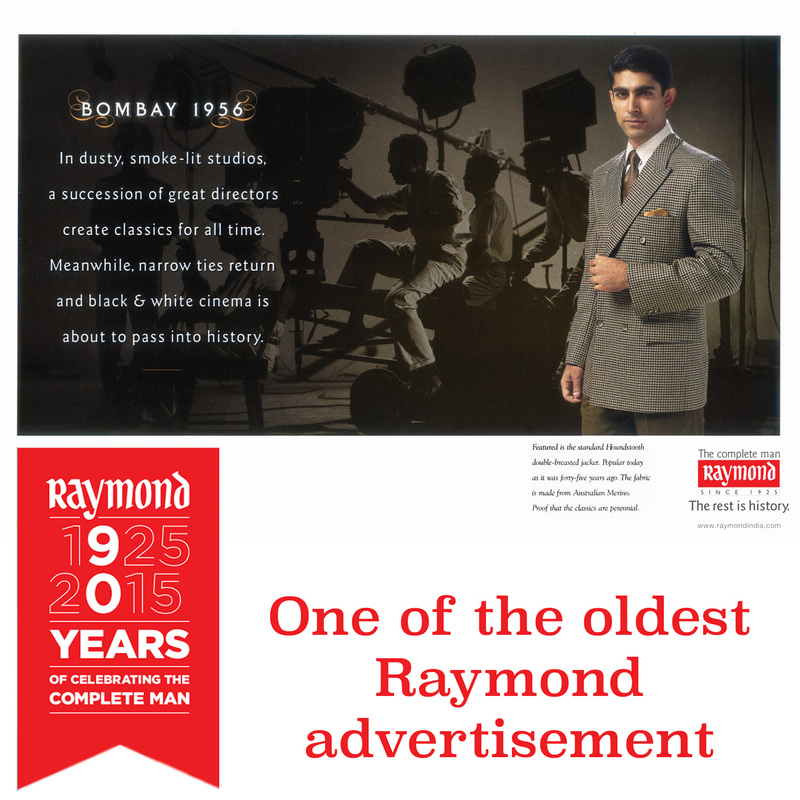 … Everybody remembers Raymond as the fabric of choice from their childhood …. That in itself is saying something … If you wanted a suit stitched, its gotta be Raymond …. if you wanted to gift during wedding season, birthdays or anniversaries, it was always Raymond suiting and shirting …. The local darzis too measured your social worth with the type of fabric you took along to stitch … Because they knew all the price ranges of the local Raymond stores and stock …. In a childhood ruled by Doordarshan, i still remember aspiring for headphones seeing model Anu Ahuja in a Raymonds Ad, and then dream romantically about The Complete Man as depicted by Raymond !! … In those young days, i did not know yet that i would grow up to be a fashion or lifestyle blogger … But the fashion and lifestyle ads was something i can recall with perfect clarity … There was the Digjam man Shekhar Kapur, the Mayur guy Shahrukh Khan, Saif Ali Khan coming home to Siyaram … But none compare to the Raymond man, he was the universal man, father, brother, going to be husband … A girl could dream of the Complete Man with the Raymond ad … her Man !! … No wonder the ad was such a success … Even the music is unforgettable, you hear it and you know that that's Raymond music …. Washing powder Nirma, Mango Fruity fresh and Juicy, Action ka School Time, Raymond The Complete Man …. these were part of my childhood much much before i discovered Vogue, McQueen and Central Saint Martins …. And these brands had one unique common ingredient … Trust !! … The creation of trust in the hearts of consumers is the cornerstone of any legacy brand … and Raymond in its 90 years of existence has earned the trust of five generations of the common man to the discerning global digital nomad !! This year Raymond introduced “Linen” , a natural fabric best suited to our Indian climate, as a fresh new endeavour …. And Aanchal and i had the good fortune to interact and associate with Raymond as its “Linen Storytellers” …. 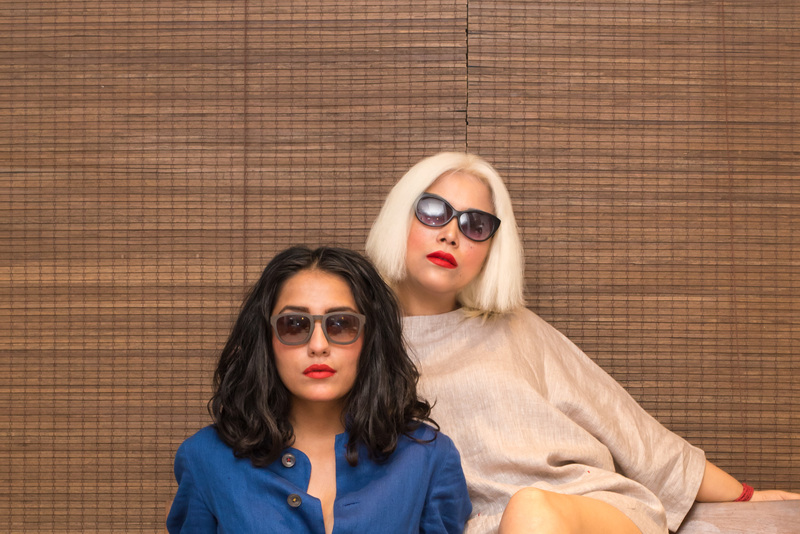 Fashion Designer Suket Dhir designs the new line for Raymond … And we are having lot of fun in Suket’s Studio trying out the prototypes for the ready to wear collection before production …. In the last pictures of this post, we are both wearing shirtwaister dresses made with Raymond Linen …. However as fashion bloggers and fashion history nerds, we feel the need to capture the story since the beginning …. before we share our fascinating journey with “Linen” and our collaborative outfit designs …. This is a profile of the incredible story of Raymond … in 2 parts …. that spans nine decades till date …. We hope you enjoy the journey back into time and know a bit more about India’s legendary textile and clothing behemoth :) … Now lets start at the beginning …. Once upon a time …. In 1921, they set up the JK Cotton Spinning & Weaving mills Co. ltd to produce high quality cotton cloth and yarn …. using only Indian capital, labour, indigenous raw materials and management methods .... The quality of their product was so superior, it could hold its own against imported material from Manchester, England .... The mill supplied cloth to clothing manufacturers throughout India ... meeting the tremendous demand of the hour — fabric, for uniforms and so on, for the defence forces. Lala Kamlapat Singhania’s empire, now the JK Group, adopted the principles of Swadeshi, the fiercely patriotic movement for India's independence from the Britishers. In 1925, propelled by the rising demand for clothing for soldiers in the Indian Defence Forces … an old gentleman named Wadia had the foresight to build a small woollen mill in the primitive area of Thane, 40 km away from Bombay ... However, Wadia Mills was not destined to remain with him for long ... as destiny would have it ... E.D. Sassoon and Co., a prominent Baghdadi Jewish industrial family of that time, took over ….. They renamed the company ‘The Raymond Woollen Mills’ …. the name was derived from Albert Raymond and his nephew Abraham Jacob Raymond …. who were noted members of the Board of directors, of E.D. Sassoon and Co. ... The little Mill spun a moderate quantity of woollen blankets and fabrics, and its future seemed secure, if unremarkable. In one of the most decisive moments in the history of this company, the Western Zone of the JK organisation entered into negotiations with the Sassoons .... Lala Kailashpat Singhania, one of the 3 sons of Lala Kamlapat …. was convinced ... that Raymond Woollen Mills held a certain promise ….. and had the potential to become something infinitely larger .... As the cold winds set in 1944 … three years before India became independent …. 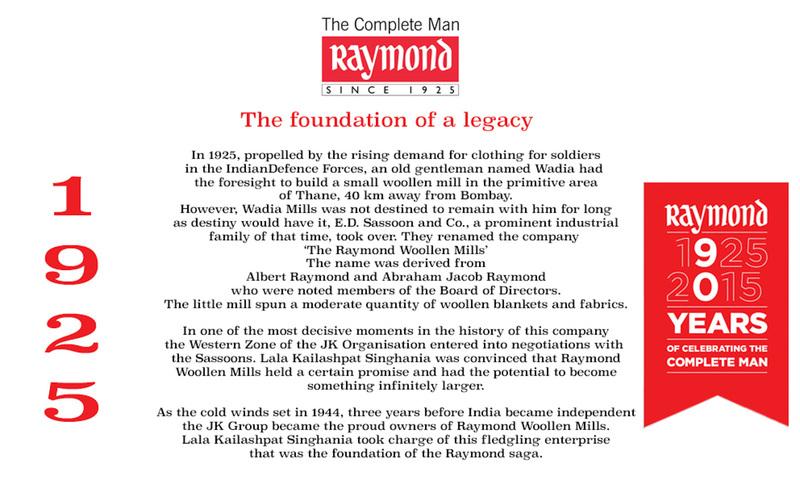 the JK Group became the proud owners of Raymond Woollen Mills ….. Lala Kailashpat Singhania took charge of this fledgling enterprise that was the foundation of the Raymond saga. Wool, which was a primary raw material for Raymond, had to be imported from Australia and other wool-producing countries .... The way forward was through modernisation of machinery and infrastructure .... and so, in what was to become a recurring pattern in the years to follow …. Raymond began consciously investing to upgrade their technology .... Gradually, the departments of spinning, weaving, dyeing and finishing were refurbished …. controlled climate conditions were installed and the old spinning frames were replaced by the new continental kind. In 1956, the company received a small export order from Fiji for its fabrics …. Two years later, Raymond exhibited its fabrics at the well-known St. Erik’s Trade Fair in Sweden and got a fervent response. Even at that early stage ... their fabric were designed to be of the best quality possible .... Striving for loftier standards …. Raymond launched its own research and development team to create new wool-based fabrics …. 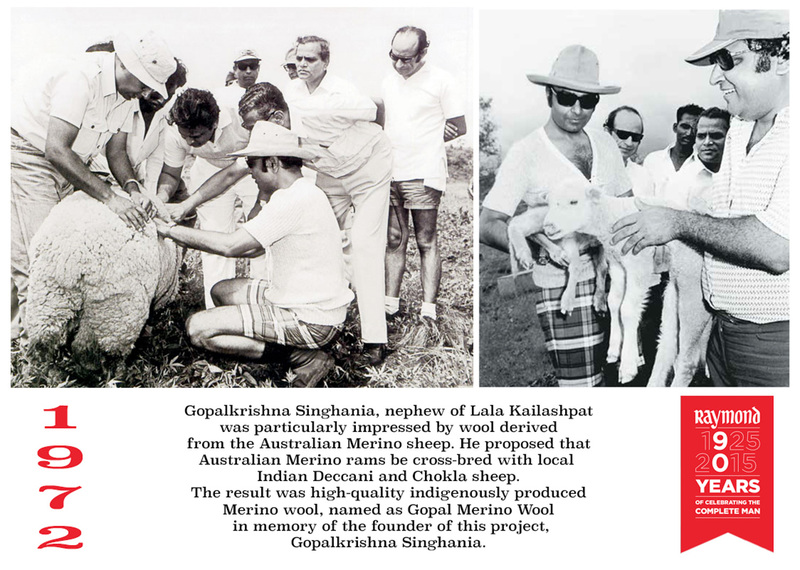 This effort resulted in the launch of the company’s first new wool-blended yarn ‘Terool’ in 1958 …. Terool turned out to be a breakthrough in the wool industry …. providing a lightweight fabric that was made for cool and comfortable wear .... It was the forerunner …. of a series of superfine fabric blends ... that would be developed later, and was well-received in the market. In 1958, at the age of 20 …. 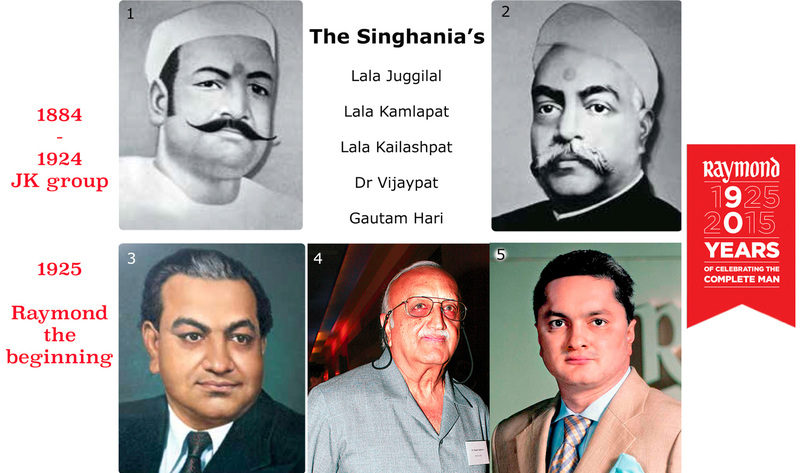 Vijaypat Singhania was formally inducted into the family business, which was being overseen by his cousin Gopalkrishna Singhania … 1958 also marked Raymond’s first venture into the retail sector. 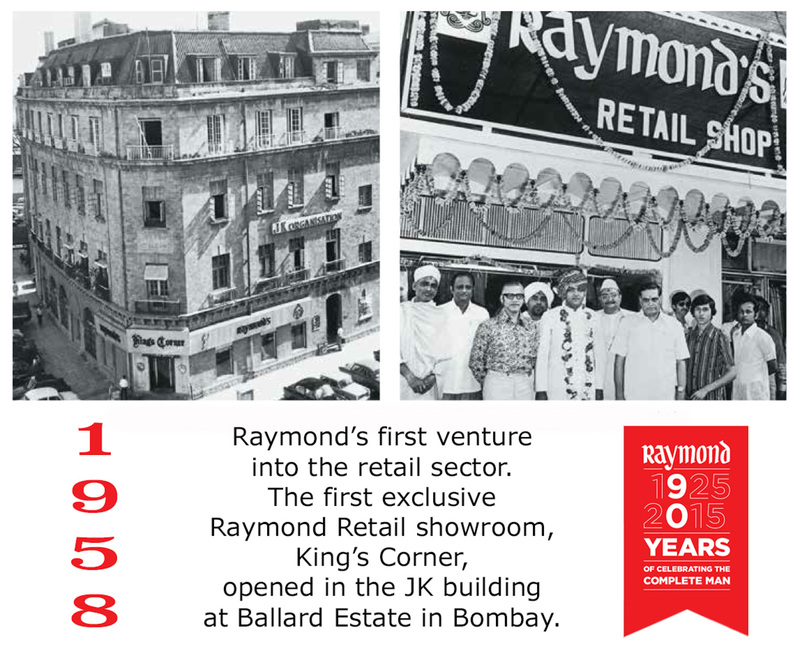 The first exclusive Raymond Retail showroom, King’s Corner, opened in the JK building at Ballard Estate in Bombay ….. This was a golden beginning and the company’s retail presence in the country expanded exponentially. 1966: The inception of a Brand Identity … By the mid-sixties … Raymond had surged ahead and was leading the domestic market ... Its lead over other competitors was not only due to the superior quality of its product ... but also because the company began a concerted attempt to reach a wider audience through consistent advertising and promotions … Raymond Woollen Mills ltd. entered the business of ready-made apparel in 1966. In 1967, they expanded to Kenya …. 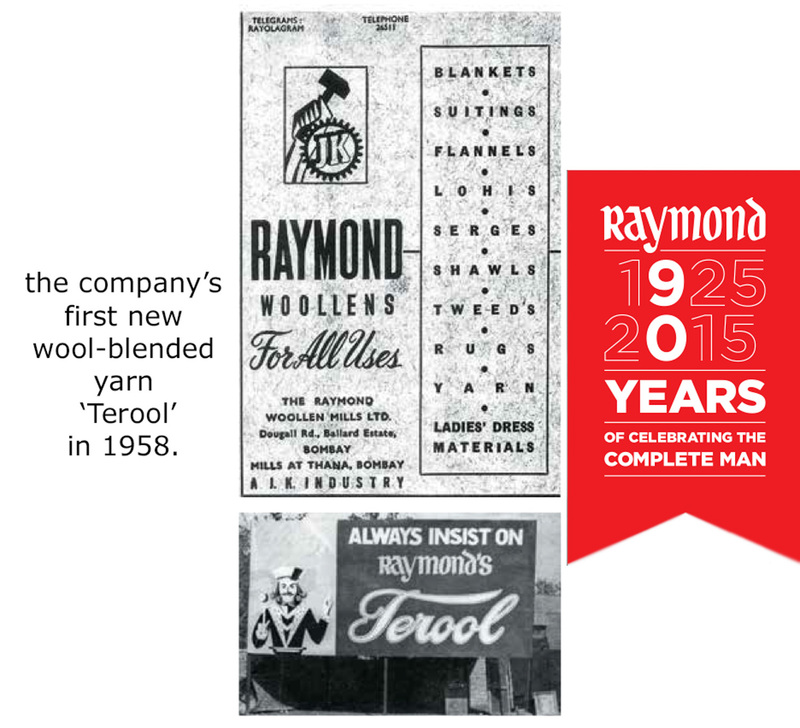 Raymond Woollen Mills (Kenya) ltd., later known as Heritage Woollen Mills ltd., was set up in Eldoret in order to manufacture hand-knitting yarn, knitwear as well as knitted fabrics, blankets and garments. Raymond was doing remarkably well also … as a leading exporter of worsted fabric to Scandinavia in particular. In the late 1960s …. the company’s research and development efforts paid off again ... resulting in a new poly viscose fabric called “Trovine" which was launched in 1968 ... making it the first textile manufacturers to use polyester wool. 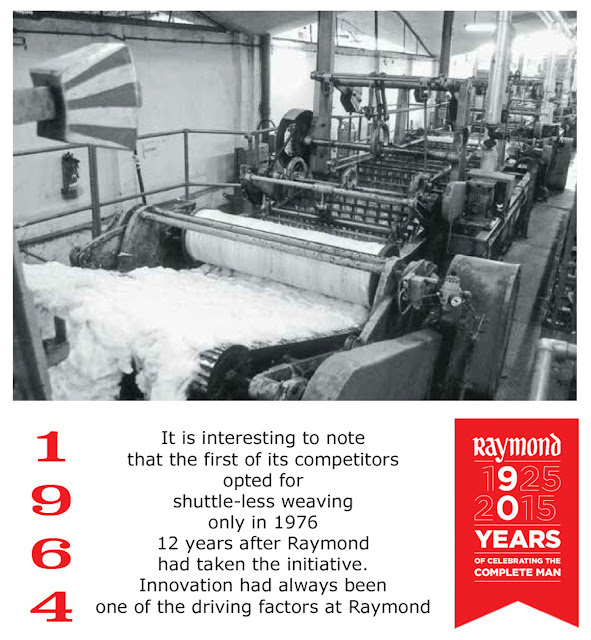 Continuing its foray into international shores, Raymond slowly but steadily entered the Swedish, danish, UK and australian markets and eventually did so well that its export earnings allowed it to run its mill in three shifts. By 1968-69, the export of woollen textiles had reached an all-time high of r26 crore, earning the company the honour of an award for outstanding Export Performance in 1969 — one of many more to come. The Indian market was still in its nascent stage ... and ready-made as a concept was confined to inner wear and shirts .... Trousers and jackets ... on the other hand ... traditionally fell into the tailored category …. In 1970, a jacket line was commissioned ... This made waves in the Indian ready-made garment trade …. as a factory-made high-quality formal jacket had never been attempted before !! …. 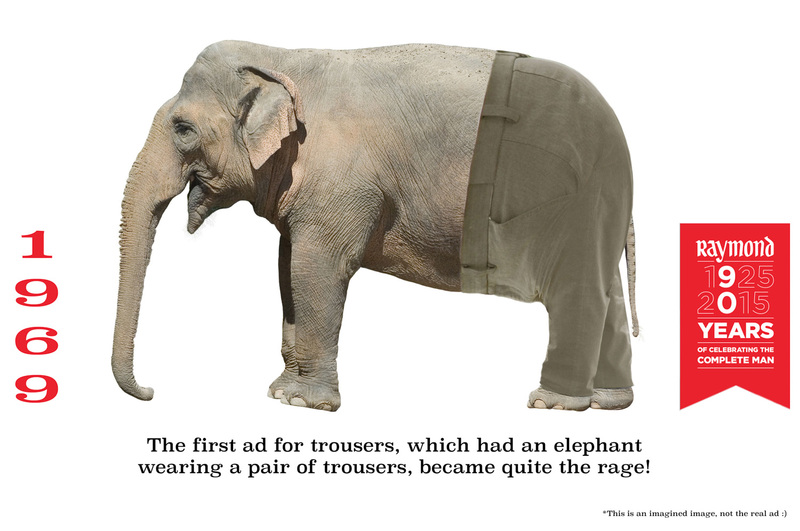 Their first ad for trousers ... which had an elephant wearing a pair of trousers ... became quite the rage !! In 1968, J.K - England ltd. … a solely owned subsidiary of the company ... was appointed to act as selling agent for woollen goods in UK … Gopalkrishna Singhania was particularly impressed by wool derived from the Australian merino sheep .... This was touted as being of the finest quality in the world .... He wanted to incorporate this beautiful luxuriant wool into the Raymond collection … So he came up with a daring and unconventional solution … he proposed that arrangements should be made to bring the sheep to Dhulia, near Jalgaon in Maharashtra ... and cross-breed them with their Indian counterparts !! …. If the plan succeeded …. it would mean that Raymond would take its place among the few companies in the world ….. who could deliver a complete solution ….. right from fibre to garment …. and become the largest integrated manufacturer of worsted fabric in the world !! The success of the Kenya venture gave Raymond the confidence to take their business model to another country ... Thus, the idea of expanding production capacity to Mauritius was proposed in 1973 … The project took off to a flying start and they remained there till 1983 as an export based unit. Raymond was the first company in India to introduce artificial insemination and embryo transfers in sheep in 1977 ... The research team also developed balanced but economical nutritional formulae for livestock ... Until 1982, the Sheep-Wool Research and Development project at Dhulia in Maharashtra …. distributed Merino rams among local farmers ... to upgrade their own stock ... giving them the potential to increase their income exponentially. Very true Raymond has been a legend now.